WPExpertsio	is ready to help you get the answers you need. WPExpertsio	will reply to your questions about Get extension name	shortly. We appreciate your feedback about your support experience with WPExpertsio, developers of Product Disclaimer. This helps us maintain high standards on the WooMarketplace, and helps WPExpertsio improve. Glad to hear it went well with WPExpertsio. Tell us more. Did WPExpertsio get back to you? Do you have any additional feeback for us or WPExpertsio? Product Disclaimer helps you to display terms and condition or any other message which suppose to be shown before user add that product in a cart. It supports the following products types of WooCommerce. 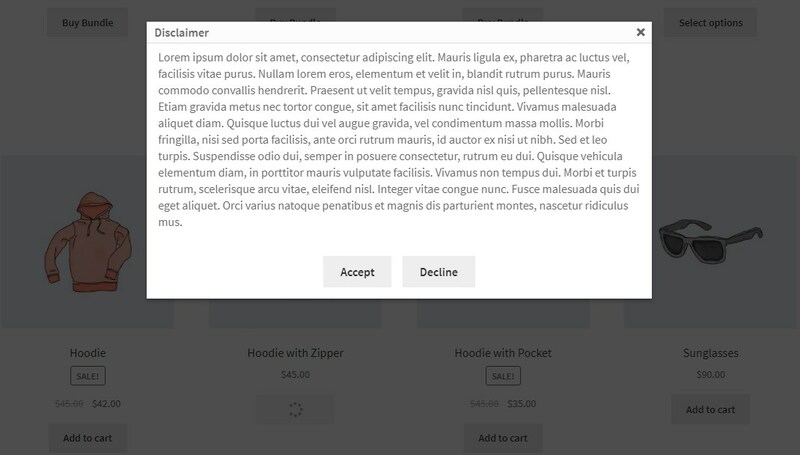 Just take few easy steps to implement disclaimer as per your requirement and add a disclaimer popup on your WooCommerce store products. There are different ways to trigger disclaimer as per product, per category or globally (one disclaimer for all products). Add a global disclaimer that will be shown to all products. Add a disclaimer to subscription product type. Add a disclaimer to booking product type. Add a disclaimer to simple product type. Add a disclaimer to variable product type.